PARIS — Today eight years after the program first launched, those onboard SWISS flight LX638 from Zurich to Paris Charles de Gaulle had the opportunity to be the first revenue passengers of the Bombardier CSeries CS100 — likely one of the two last all-new clean sheet aircraft to be designed and built in the west to enter service until the next decade. 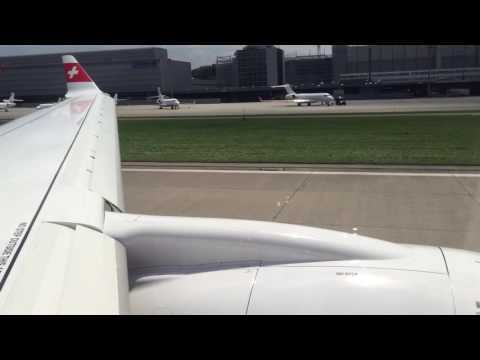 My journey to catch the first CSeries revenue flight started with a short hop from London City (LCY) to Zurich, just after the Farnborough Airshow, taking the opportunity to fly the outgoing Avro RJ100 as an appetizer—and point of comparison—to SWISS CS100 to about to enter into service. The airline said that all RJ100s will be phased out by Summer 2017, replaced by the CS100. Swiss has 30 CSeries on order split between the CS300 and CS100 with 9 joining the fleet by the end of 2016. The Avroliner is the semi-official aircraft of London City, given its steep approach and short field capabilities, two attributes that several new generation jets such as Embraer EJets, SuperJet SSJ100 and Bombardier Q400 and CSeries have in common. And although the Avroliner and the CSeries boast similar capacity, that’s where any similarities stop. We quickly taxied down the runway (there is no taxiway at London City) and the Avroliner performed its characteristic 30-second fully rated steep takeoff out of the airport. While the RJ100 registered 95db in the cabin forward of the wing, I just registered 82db with the CSeries in a media flight prior to delivery in Montreal in early July. The cabin of the RJ100 is also an aspect in which diverges with the CS100. Don’t get me wrong, the 2+3 seat layout of the Avroliner, the Recaro seats and the larger baggage bins, still offer a modern and fresh ambience despite its age. The Business Class cabin —actually the first three rows of the aircraft— is configured in Euro style with 1+2 seating arrangement blocking the middle seat of the rows. A curtain serves as a divider and provides passengers some privacy. The so-called Swiss punctuality is not an euphemism, and in today’s flight it was no exception. By 11.30, all passengers began to gather around the Gate B34 at Zürich Airport, the largest international airport of Switzerland and the principal hub of SWISS. There, our aircraft (Kanton Zürich • HB-JBA • MSN 50010) was waiting for us to board. This CS100 just arrived last Friday after a handover ceremony in Montreal, the first of nine CS100 to be delivered this year. The ceremony started at 12.00, hosted by SWISS Chief Commercial Office Markus Binkert and Dominique Rinderknecht, who was Miss Switzerland 2013 and the flight’s crew, who welcomed the passengers to travel to Paris CDG today. SWISS Chief Commercial Officer Markus Binkert presented a special certificate to mark the occasion to passenger and Zodiac Airspace executive Thomas Marks Lee, the world record holder for first flights on a new aircraft type — including the first flight of the Boeing 747, 787, and Airbus A380. This was followed by the traditional ribbon-cutting ceremony, which was performed by Binkert and the crew, together with Dominique Rinderknecht. After the ribbon cutting, 101 passengers (30 in Business and 71 in Economy) were invited to board the fully booked aircraft. On this flight, the vast majority were press, VIP’s, and enthusiasts with only a few regular passengers. Some passengers such as Rob Coy who flew in all the way from Abu Dhabi to fly the CSeries inaugural had created special commemorative t-shirts. The crew of the flight was led by Captain Jonathan Sprenger, together with two other pilots, three flight attendants and an engineer. As Andreas Spaeth reported last week on the CSeries demo flight, the airliner has a cabin configuration for 125 seats in 30″ pitch and in a two-class configuration (20 in Business Class and 105 in economy) and 26 rows, using Zim slimline seats which are comfortable enough for short flights, with 17.3″ width and a 20″ wide aisle. The oversized windows, some fifty percent larger than an Airbus A320, oversize binds, and high celilings give the CSeries a widebody appeal. Adding the supple, tasteful brown leather selected to upholster the seats, plus the novel mini screens in each seat row for safety briefings and moving maps, the SWISS CS100 is a step forward when compared to the now outdated RJ100s. “When I compare to the Avro it replaces, the RJ100 is a museum. The CSeries is the future” commented Sven Thaler, SWISS Deputy Fleet Chief. “From the cabin, you are not able to hear the engines anymore.” He said. By 12:35, our pushback commenced after an on-time, expedited 10-minute boarding. However, a minor glitch between the switching between ground power and the APU (Auxiliary Power Unit) by airport rampers disconnecting the power cable before the pilots could push the transfer switch, caused a power restart, and subsequently we lost our takeoff slot at Zurich. During our delay on the ground, Peter Koch, the sought after and engaging head of the CSeries fleet highlighted some of the characteristics of the CSeries when compared to other aircraft in the SWISS fleet. “Particularly, I appreciate the heads-up philosophy in the cockpit, which is made by pilots for pilots” he noted. When questioned about the London City operations, Koch said that to date, SWISS leads the operations at London City with 52% of the daily flights there. He assured that the certification is underway and it will be completed by the 4th quarter with operations commencing early in 2017. “Training for SWISS is easy as most pilots fly to London City already” boasted Koch, who also highlighted that the CSeries will be able to takeoff from LCY without any payload penalties. Finally, at 13:15 local, we taxied out to runway 10. 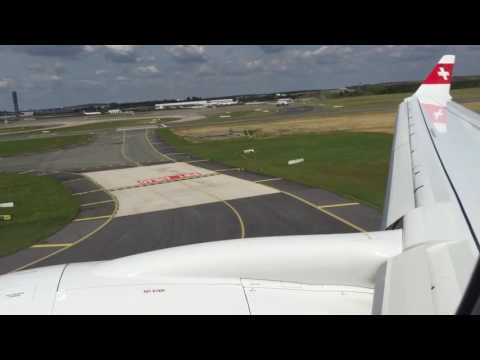 The water cannon scheduled on both ends was cancelled due to the events and late departure At precisely 13:30 local time, we lined up on Runway 28 and the CS100 performed a smooth, quiet Pratt & Whitney Geared Turbofan 28-second derated at 90 percent takeoff roll bound to Paris CDG. During the short and smooth 54-minute hop, Koch shared some details of the initial SWISS CS100 operation, confirming that the second CSeries will enter into service on August 15. “Today, we have started service with 2 round trips to Paris and Budapest, while tomorrow we will start with 3 round trips from Zurich to Manchester, Budapest and Prague. We can turn the aircraft in as short as 35 minutes, though 1 hour will be the norm.” Koch said. When asked about the advantages of the CSeries over the outgoing Avro RJ100, Koch highlighted that the range of the CSeries exceeds by 1,100 nautical miles (at 2,900 nm) the maximum range of the Avroliner, with a fuel burn reduction of 34% over the RJ100 and a noise footprint lower when compared to the A320 family aircraft in service with SWISS. “The sweet spot for this airplane is the flexibility and the efficiency. So far, we are limiting our initial operations to flights of up to two hours, but in the future we will deploy the CS100 to flights of up to 3.5 hours, such as Moscow” Koch said. Once seat belt signs were turned off, the cabin crew sprang into action, serving a impeccable snack (trout mousse and Black forest roulade) to all those onboard with a full-bar service. In just seven minutes after takeoff, we reached our cruise altitude of 18,000 feet. To commemorate the event, a miniature CS100 scale model and first flight cards were handed out to passengers. Peter Koch had a busy time signing autographs. No doubt he has become a CSeries celebrity. The special inflight activities planned were scrubbed as well. However, there was still a good deal of convivial mingling throughout the flight as the cabin crew deftly performed their service. The extra wide 20″ aisles of the CSeries no doubt made their job easier. 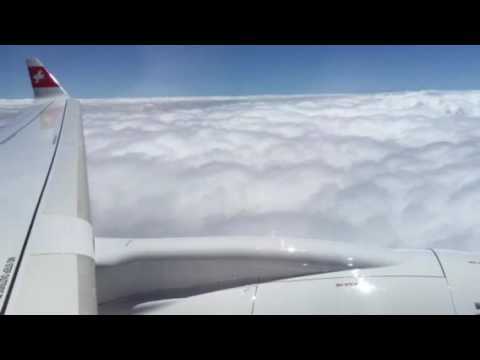 The flight was perfectly smooth, with the composite wings barely flexing in the clear air. Too soon, we touched down to smattering of applause at 14:23 local Paris time, over 30 minutes behind of schedule after our minor mishap before departure at Zurich. Unfortunately, there was no water cannon salute in respect to the victims of the events that unfolded in Nice last night. At the arrival, I had a brief conversation with the crew about the technical details of the flight: out takeoff weight was 62,654 kilograms (138,130 pounds), with 6,300 kilograms (13,890 pounds) of fuel on board. Interestingly, the fuel onboard after the flight was enough to cover the return flight. The flight was also a first for SWISS and in commercial services for France. According to Captain Sprenger “we flew the very first satellite-based approach into Paris CDG” the new navigational system allows performing safe landings under extreme weather conditions. The laughter in the cabin from the Captain’s chutzpah statement was uproarious. The aircraft quickly turned around to Zurich and began routine operations on time. Other than an inflight announcement and a small presentation and buffet at the gate, the flight seemed like any other. Most passengers on the return flight were initially unaware that they were on a new aircraft, but once aware a few became quite curious and impressed – peppering the crew with questions. Once back on the ground in Zurich, the SWISS’ CSeries made a quick turn and headed off to Budapest on its mission to complete four flights on its first day in operation. The CSeries certainly has momentum on its side. But while the jury is still out on its commercial success for Bombardier, Swiss and its first CS100 passengers couldn’t seem more delighted.